Foligno is one of Umbria’s larger cities that lies in the plain of the river Topino making it one of the few Umbrian towns to be built on flat land. In the past, Foligno was at the crossroads of two important commercial roads, the Via Flaminia and the road from Perugia to Assisi. Unfortunately Foligno was hit by an earthquake in 1997 which did quite a bit of damage to the city, though much of it has now been restored. Foligno is one of Umbria’s most important commercial and manufacturing centers so is often overlooked as a tourist destination. It is however a very active city with great shopping, restaurants, and a number of historical sites worth visiting. How To Arrive in Foligno – Foligno lies directly on the Rome/Ancona train line making it easily accessible by train. Buses run from Foligno to Montefalco, Bevagna, Trevi, Spoleto. Assisi and Perugia. The bus station can be found on Viale Mezzetti. Parking is limited in the city center although an underground car park can be found near Porta Romana which is also close to the tourist office. What To See in Foligno - Piazza della Repubblica is said to be the center of the town and is where you can find the Duomo facing the Palazzo Comunale. The Duomo is of interest as it actually has two facades. The main facade faces Piazza del Duomo, but the more interesting facade can be found on the south side which looks out to Piazza della Republica. The Duomo was started in 1133, added to through 1512, and was restored to it’s present Romanesque appearance in the 20th century. The Palazzo Comunale has a Neo-Classical facade and was originally built in the 13th century. The palace was rebuilt several times, retaining only it’s original tower which unfortunately was destroyed in the 1997 earthquake. The palace is linked to Palazzo Orfini where it is thought was the home of the painting house of Orfini, one of the earliest of all Italian painting houses. At the western end of the piazza is the Palazzo Trinci which has been altered many times throughout the years and now is home of the Pinacoteca Communale and the Museo Archeologico. The interior of Palazzo Trinci dates back to the period of Ugolino III Trinci who ruled from 1386 until 1415. You can view many paintings and frescoes within Palazzo Trinc, including important works by Ottaviano Nelli, Niccolo Alunno, and Pier Antonio Mezzastris. If you follow Via Gramsci from piazza you will pass by many of the Folignati palaces including the 16th century Palazzo Deli which is considered one of the most attractive and features a medieval tower that once was part of Palazzo Trinci. The Church of Santa Maria Infraportas at the end of Via Gramsci is one of Foligno’s oldest churches and has unusual 12th century windows and portico as well as frescoes by Mezzastris and others. Although other churches in Foligno are also contain some important artwork, one of the more important ones is the Church of San Niccolo on Via della Scuola di Arti e Mestieri which was rebuilt in the 14th century by Olivetan monks, then rebuilt in the 18th century. This church houses works by Foligno’s own Niccolo di Liberatore, known as Alunno including the Polyptych of the Nativity which is considered one of his best works. If one heads east from Foligno on road #77 for 2 kilometers you will come to a road that leads up to the Abazia di Sassovivo, the 11th century Benedictine abbey with a 13th century Romanesque cloister. The cloister features 128 columns that support 58 arches that are decorated with marbles and mosaics. The Giostra della Quintana which takes place on the weekend closest to June 14-15 is a 17th century custom that involves knights from 10 districts jousting, historical foods, games, and parades. I Primi d’Italia is a food festival that takes place the end of September in locations across the city centre in a four day event. The event highlights the world of the first courses with options from many regions across Italy. 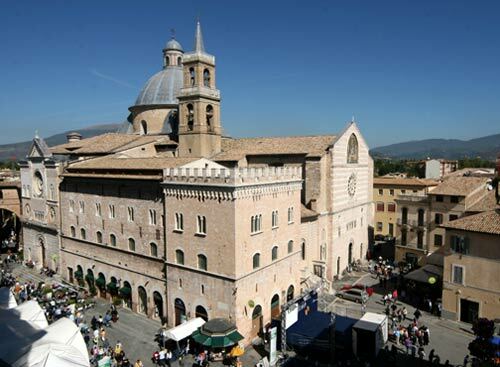 Markets in Foligno take place on Tuesday and Saturday on Via Nazario Sauro.